"Hello there, the curtain arrived. It is gorgeous. Mahalo for your assistance. :) "
You have a choice in where to buy your bamboo curtain. Yes, we have competition in the bamboo doorway business, but not much. Some arrived after we started our business, but we're still here while others have gone. Selling bamboo door beads is not like a fly by night business like selling cheap Android phones. We know this business because we were one of the first online and we care about delivering a good product. Okay, a bamboo curtain is nothing like a shiny new iPhone, but it does one thing very well: provide a classic and natural materials doorway hanging of great appeal at a reasonable price. 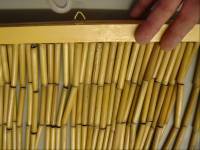 UPDATE: NEW 135 STRANDS NATURAL BAMBOO DOOR BEADS IN STOCK! WE HAVE MORE BATIK AND BAMBOO CURTAINS OF BETTER QUALITY AT LOWER PRICES, and we don't show fake "Regular Price" and phoney "On Sale Price" to con you into believing you're getting a great deal when all you do is pay regular price. Like Joe the plumber or Joe Lieberman, we have a reputation to uphold for being sincere and well-meaning citizens (not sure about Lieberman, though). The truth is, our public option offering means quality comes at a price, so just like Joe Sixpack would, we stick with those suppliers whose products don't turn into customer returns. That said, read our 100% Satisfaction Guarantee . They're back and they're hot, but these Premium Quality (125-135 strands, not 70 or 90, like the "competition") Bamboo Bead Curtains are keeping you cool! Painted bamboo curtains are back from the past and hotter than ever here in Hawaii and tiki-inspired rooms around the world. Replace your boring old screen door with a bamboo curtain. We feature highest strand count on our Premium Quality bamboo beaded door curtains plus 360 degrees roundabout painting for a cleaner image. Click images at right to view all bamboo curtains. All come fully assembled and ready to hang. View also our non-Hawaiian/non-tropical designs. Unlike other vendors who order bamboo curtains by the shipload, we order small batches. Rather than bringing out the whole village, from young to old, to paint bamboo with various result, our approach ensures that only skilled artisans work on your curtain. Our bamboo curtains are made by hand from small shafts (or beads) of bamboo that are selected to be wider toward the top of the curtain and narrower toward the bottom. This allows the bamboo strands to move aside easily when you pass through. To hang a beaded bamboo curtain all you have to do is line up the hanging rod's eyelets with the desired height on a wall or door and fasten with nails or screws. This takes just minutes, unless you're male and own a tricked-out toolbox.